Located in the city centre of Alcalá de Henares, in calle Cerrajeros, nearby the city Council and the Mercado Municipal de Abastos. Rounded by many places of interest, turistic monuments and buildings, leisure zones and restaurants. - City council: 0 minutes. - City centre (Plaza Cervantes): less than 1 minute. - Mercado Municipal de Abastos: 0 minutes. Just in the middle of the recreational centre of the city at weekends (many "bares", restaurants, club "Hanoi House" and theatre "Corral de Comedias"). Restaurant La Terraza del Mercado stands out by its seasonal menus, its mediterranean cuicine and its desirable location, just over the old market hall in the historical centre of Alcalá de Henares. Interparking is the nearest car park, in the same building, then the most suitable option to enjoy of this symbolic place. 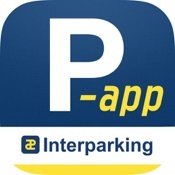 Park with the P-app and get a 1 € discount on the daily maximum. Commercial vouchers available, please ask in the car park. Different types of subscriptions available. Please ask for more information at the car park or call to the number in the description.